2015 140G Artisan II Custom made aquarium quality and performance with simplicity of an A-I-O. Welcome to our newest, largest and most heavily packed Reefing system ever. Equipped for the savviest reefer who look for the best technology as well as the best material all built by highly skilled 20 year aquarium Artisans. The 140G Artisan II Modern reef package is for you. Artisan II Series aquarium packages consist of using all of the highest quality materials and professional equipment you would only usually find in custom aquariums. We then simplify the process so that it is simple to set up in 3 steps (Fully assembled furniture cabinet, pre-cut plumbing, and custom sized equipment). Combined with over 20 years of Aquarium equipment and cabinetry expertise, we give you the ultimate Luxury and Performance in one system. *Comes included with our new 36” tall Piano finished Oil-based painted cabinets (Fully assembled). Permanently sealed joints for the best water, salt, vapor resistant and heavy load capacity. Overall height of system is 54", perfect eye-level. Our Artisan cabinets are many times stronger than lower quality MDF flat packed cabinets. 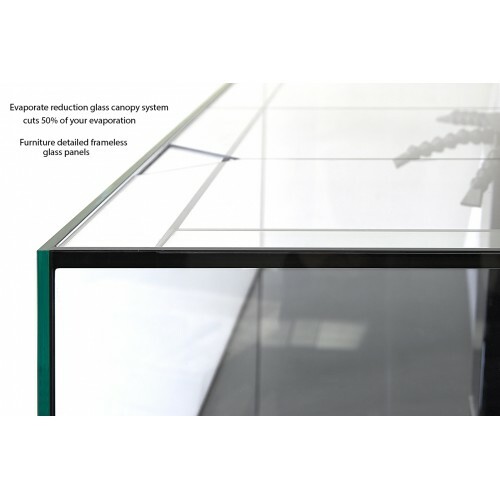 *CAD Lights Artisan Aquariums use Low iron ultra clear glass for all viewing panels. Each panel of glass is high polished and joined by solid professionally tooled black seals. 1/2" Thickness with a 5/8" thick bottom. Euro-braced for heavy duty use and extra longevity and durability. *High speed Reef ready Trapezoid overflow boxes that are specially designed to run silently. 1-piece custom curved with reinforcement tabs. 3 return ports to easily access all areas of the tank. *Spacious footprint at 71.5" x 23.5" x 18". Overall height with cabinet is 54". *Artisan II Professional Extra large multi-chambered sump. Very roomy 55G volume that gives great performance with extra room to spare for future add-ons. *Complete plumbing system with Durso drain with Modified Herbie Style. Total Silence. *Comes stocked with our latest Gen-3 PLS-280 (300G Professional Cone protein skimmer). No need for upgrading this big skimmer as its already rated for Heavy loads for the 140G Artisan II. 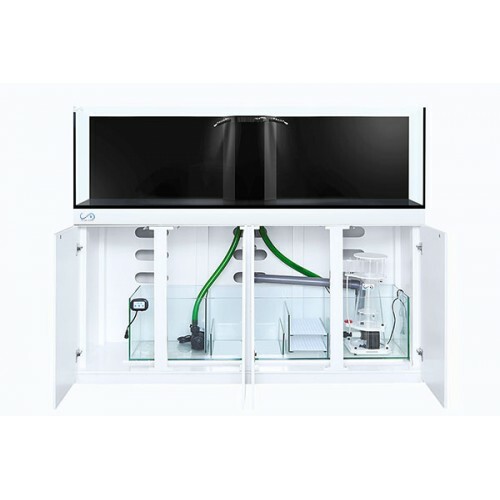 Each 140G Artisan II Aquarium is matched with an equally impressive built cabinet. Our Artisan II 140G cabinets are not made of MDF and not PVC wrapped. Each one is furniture grade Maple plywood that are fully assembled and professionally oil-based painted for a beautiful high gloss Piano finish or stains. These finishes are also incredibly durable against water, evaporation moisture, salt and weathering that will NOT swell, fall apart or warp like MDF or pressed woods would. Each joint is triple reinforced specifically for heavy weights and water resistance. Available in 2 colors (Piano Gloss White, Piano Black). Every cabinet is built by a custom cabinet craftsman and finished in a heated paint room for that High end professional cabinetry finish. 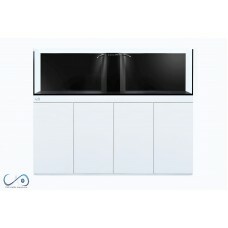 (Cabinets are included in the 140G Artisan aquarium package).